There are many reasons for sun worshipers to be! The fact that solar radiation is to improve our mood is not the only one - many people see in the sunlight just better. A wonderful day, a smile or a ray of sunshine: the finer things in life can be captured not always as easy as with Color Touch Sunlights! The 7 Color Toch Sunlights bright shades gently on the hair not to cover it with paint. The hair with Color Touch Sunlights from kissed by the sun! Her hair shines with brilliant, natural-looking highlights. Even when the sun is hidden behind the clouds. Mix Color Touch Sunlights with 1.9% - 4% COLOR TOUCH EMULSION. Mixing ratio of 1:2, e. g. 30 g Cream + 60 g Emulsion. Apply with brush and bowl. For a more efficient application, we recommend using the applicator bottle. Apply Color Touch Sunlights to pre-shampooed, towel-dried hair – evenly from roots to ends. If needed, the development time can be extended by 5 minutes. 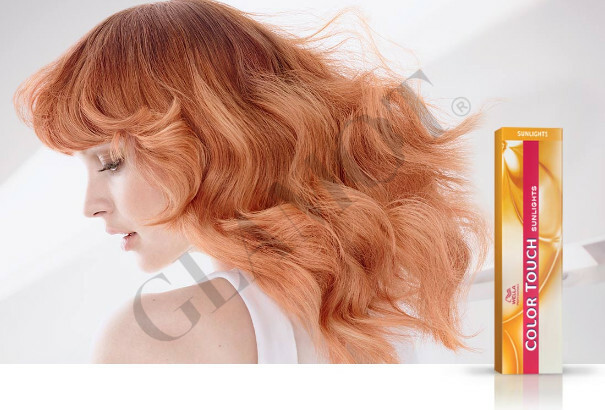 For application you need developer Wella Color Plus Emulsion, which we sell separately.